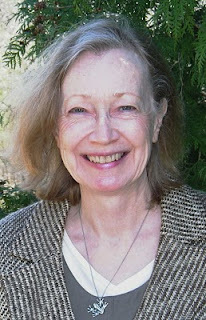 This is an interview with poet and member of NCWN-West, Karen Paul Holmes. It was published online last year. GCB: Your new book is No Such Thing as Distance, published by Terrapin Books. Did you have a particular audience in mind with this collection? KPH: First of all, thanks so much for this interview, Glenda. My goal is to create poems that touch people in some way—through an aha-moment, a connection to the subject or image, a shared laugh, etc. By people, I mean anyone, not a specific audience. When I chose poems for this manuscript, I did have themes in mind but hoped the book would appeal to a variety of readers. The interwoven themes are family (especially Macedonian cultural traditions), music, nature, grief, and healing. I included a few traditional recipes at the back of the book, because cooking together is one ways my family connects, and, of course, that’s pretty much universal. GCB: I like getting to know your parents in the poems in your latest book. I had the pleasure of meeting your mother when she came to my studio, when my dog stole her lunch. She was a good sport. She must have loved your father intensely to leave Australia to marry him and live in the United States. In the poem, “Matilda Waltzing,” we sense she harbored homesickness, as any of us would likely feel. Did she tell you she was homesick and that she missed her family in Australia? KPH: It’s funny you brought up your dog stealing her lunch, because my dog stole her Angelo’s Coney Island hot dog once! That was my dad’s restaurant in Flint, Michigan, and the recipe for the secret sauce is in the book. Anyway, I don’t ever remember my mother using the word “homesick,” but she always talked longingly about Australia, and she really hated Michigan winters. After she moved to Florida, she felt more at home in the tropical climate, but I think she remained nostalgic about the home and family she left Down Under—she only returned twice to visit. My siblings and I used to time how long it would take her to tell a stranger that she was from Australia – usually under five minutes. To be fair, though, she still had some of her accent, and people would often ask where she was from. But when she answered, she made it seem like she was just visiting the US temporarily, which says a lot about her strong roots. GCB: “Macedonian Bean Soup” surprised me. It hails back to your marriage, your ex-husband, and your father. Food brings forth stronger memories than almost anything, and I enjoyed the image of your husband and your father cooking the soup. Have you made this soup? KPH: Yes, I found my ex’s handwritten notes and made the soup for the first time last year. The poem says “Perhaps one day, I’ll make it myself,” and so I thought, “What’s stopping me?” It was yummy and just like my dad would make. I’m kind of sorry some of the poems mention my ex, but certain events or themes always seem to slip into our writing, don’t they? So I just have to accept that. The 31-year marriage was a huge part of my life, after all, and affects how I am today. KPH: My process is almost always the same. Something gets into my head—usually a line or a title—and sometimes that something turns into a whole poem that might meander into an entirely different something, like how killing the ants turns into releasing frustrations for all sorts of past events. I think in this case, the ants’ drunkenness seemed funny and interesting to me, hence the first two lines, “Drunk on liquid bait, they stumble/ across the white bathroom tile.” If I remember correctly, those lines started out as the poem’s opening and remained through all my revisions, though often I move things around when editing. GCB: “Confessions of an Ugly Nightgown” is one of my favorite poems. This is a persona poem. How did this idea come to you? Did your mother talk about her life growing up in Australia? KPH: That’s quite an old poem, perhaps the first one I wrote about my mother. The title came to me first, so then I had to try telling the story through the nightgown’s viewpoint, and it seemed to work. Yes, my mom talked about Australia all the time, and she had lots of old family photos. Aussie relatives had come to visit over the years, so I heard their stories too. My mother really didn’t keep many things from her past, but the nightgown was always just sort of there in a box, and then somehow I ended up with it. As I grew into young adulthood, I started appreciating the loyalty and bravery it took for my mother to sail across the world to marry someone she couldn’t have known all that well. I felt compelled to write about that, and the nightgown’s journey seemed like one way to do it. GCB: I have always been drawn to looking into lit windows of houses as I pass by, where strangers live and families gather. Your poem, “Road Stories,” grabbed me, and I will read this one often. What prompted this poem? KPH: I started keeping a list of road names that were funny or intriguing. I often wonder about how a road got its name, but like you, I also wonder about people inside, especially when it’s dark and the lights are on. So, I don’t know how, but the poem started emerging and then traveling to different places (which seemed appropriate for a “road” poem), ending up with Dorothy in Kansas! GCB: Although it is unusual for a poet to submit the same manuscript more than once to the same publisher, you sent this one to Terrapin Books a second time after it was first rejected a year or so before. Why did you think it would be accepted the second time around? KPH: Well, I had no idea about my chances of acceptance the second time, but because the editor had given me constructive feedback on the first submission, I thought she cared enough about my work to take a second look. So I emailed her, saying I’d made revisions based on her input (mostly about the order of poems) and asking whether she’d like to see it again. And she said yes! The moral of the story is: Pay attention when editors (of journals or books) take the time to give you feedback on a submission or otherwise give you encouragement, and don’t be afraid to resubmit. GCB: You have been quite successful publishing your poetry in journals and reviews. Your first poetry book was well received. What advice can you give to poets who want to see their books published by a reputable press? Is there a special tip you can offer a poet to make their work acceptable? KPH: I did what my mentor, the poet Nancy Simpson, suggested: Get your poems published in journals first. Usually, that means a lot of work perfecting your poems, hopefully by attending workshops or critique groups, and then submitting to lots of journals. My acceptance rate ranges from 6%-13%, so that means I submitted many poems over several years to get into the publications I’ve been in so far. Duotrope, the submission tracker I use and recommend, says my ratio is “higher than the average for members who have submitted to the same places.” For the last two years, I made it a point to only submit to journals who take less than 5% of the poems they receive. While my ratio went down, my credentials went up because I got into some top journals. In the submission guidelines for chapbooks or full-length manuscripts, publishers will usually require that a certain number of the poems have previously appeared in reputable publications. GCB: You attended the AWP Conference in Tampa, Florida. Please tell us about that experience. What were the highlights of the conference for you? KPH: AWP is huge—10,000 writers—so it’s better if you go with someone, which I did. I loved hearing David Kirby, Mark Doyy, Natalie Shapero, and others read their poems, and I met poets and editors that I had only known online. I was honored that the editor of Lascaux Review, Stephen Parrish who lives in Germany, came to my book signing and bought a book. I will say, though, that I prefer to attend workshops led by an accomplished poet where you revise and edit your work for a week or so. I loved the Palm Beach Poetry Festival, San Miquel (Mexico) Poetry Workshop, and the Sarah Lawrence Summer Seminar, and highly recommend them for improving your work and making connections with other writers. GCB: You teach writing and host writing events. Why do you think poets should take classes and participate in literary events? GCB: Thank you, Karen, for answering these questions. Scott Owens who is not a member of Netwest, but is a representative for NCWN, is the subject of an interesting article in Pirene's Fountain. Read it here and learn more about Scott and his poetry. Scott Owens will be in Hayesville and Hiawassee, GA in May of next year to do a workship at Writers Circle and to read at Writers' Night Out. 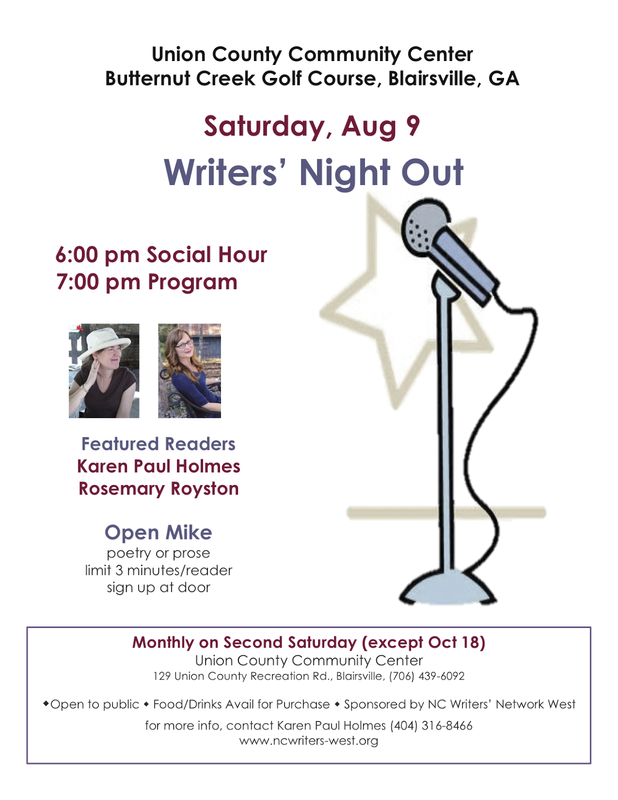 Writers’ Night Out will feature poets Maren O. Mitchell and Clarence Newton followed by an Open Microphone for those who’d like to share their own poetry or fiction. The event takes place October 8 at 7:00 p.m. in Wilson Lecture Hall at Young Harris College, Young Harris, Georgia. Maren O. Mitchell has worked as a proofreader, managed a group home, taught poetry at Blue Ridge Community College, Flat Rock, NC, and catalogued at the Carl Sandburg Home National Historic Site. A North Carolina native, she now lives in Towns County, GA with her husband and two cats. 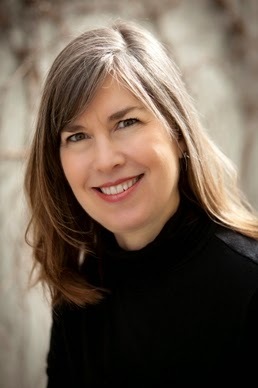 Her poetry publishing credits include Red Clay Reader, The Richmond Broom, The Arts Journal, Appalachian Journal, The Journal of Kentucky Studies, Wild Goose Poetry Review, Southern Humanities Review and the anthology, Echoes Across the Blue Ridge. Clarence Newton, who lives in Hiawassee, GA, puts both humor and wisdom into his writings. Once a guest writer for several newspapers, he has turned his love of writing toward poetry. 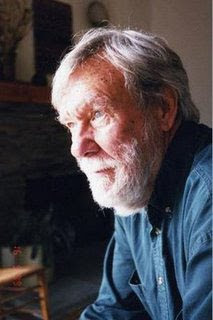 He has studied under former Poet Laureate of Georgia Bettie Sellers and under poet and resident writer at John C. Campbell Folk School, Nancy Simpson. His work appears in Echoes Across the Blue Ridge. After a long career in aviation, Clarence now finds inspiration in the things of retirement, such as fishing, gardening, and birding. Writers’ Night Out takes place the second Friday evening of every month from 7-8:30 p.m. Formerly at Mountain Perk Coffee House in Hiawassee, the event now takes place at Young Harris College in Wilson Lecture Hall, which is located in the Goolsby Center on the campus. Parking is free. Those interested in reading at the Open Mic may sign up at the event. Each writer will have three minutes to read fiction or poetry. The evening is free and open to the public. For more information, please contact Writers’ Night Out coordinator, Karen Holmes at (404) 316-8466 or kpaulholmes@gmail.com.